As St Albans Morris Men, the club danced in and around St Albans (that’s in Hertfordshire, UK) for 80 years. 2016 saw the most major change since the formation of the side, to include women members for the very first time and revitalise the side for the 21st century. Come and see how St Albans Morris are getting on at any of the spots in our Summer Programme. 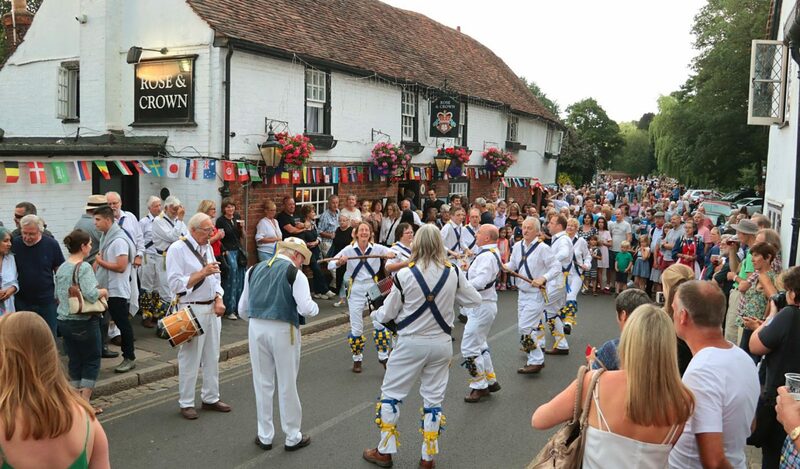 You may notice from our programmes that we often dance outside pubs. This is not for our benefit, of course. It is principally so that you, the public, can sit at ease – enjoying a pleasant drink and wondering “How DO they do it?” But there is the added advantage that if any of our people are looking peaky, you could buy them a drink. This is optional, of course, as is putting a coin in the hat. Our pub spots are free entertainment. No licence fee to pay. No commercials. Almost too good to be true. I’ve no idea what you are talking about. What is morris dancing? You interest me strangely. Tell me more about your club’s history. Do you have a “Frequently Asked Questions” list? I am a nosey dancer from another club. What dances do you do? Supposing – just supposing – I wanted to take up morris dancing….. So it’s all just Hankies in Hertfordshire is it, then? What do you know about the morris dancing pictured in the Betley Window?